Cruit Island Golf Links is probably the finest nine-hole links in all of Ireland, with a panoramic backdrop of rockscape, sea, off-shore islands and Mount Errigal in the background . In a country of wonderful par 3s, the sixth hole is one of the greatest of them all. No par 5s, but lots of wind, blind tee shots and rollicking links terrain. This is truly golf at the end of the earth. Guests that stay at our Cottages in Donegal can avail of special weekly discounts. Simply enquire at the clubhouse. There are very few courses which deserve to be called ‘hidden gems” but Cruit Island is one of them. It is a magical clifftop course that overlooks the Atlantic from almost every hole and provides challenging and refreshing golf for both long and short handicappers. Wind is a constant factor here, as it should be on any true links. A number of extra bunkers have been added in recent years but the overall challenge of this course remains unchanged. Your journey from the first tee to the last green is certain to be one of the most exhilarating and memorable you’re likely to make in your golfing lifetime. I Play Cruit every summer about 15 – 20 times within 2 weeks.. And i will tell you that i still have not mastered every hole. This course is a really great course, one of my favorite in Ireland, and i would put it in front of Royal County Down anyday! Pitty though its not an eighteen holer! Since first playing this stunningly beautiful links three years ago, I’ve been desperate to return. Two weeks ago I did, and I was not to be disappointed. 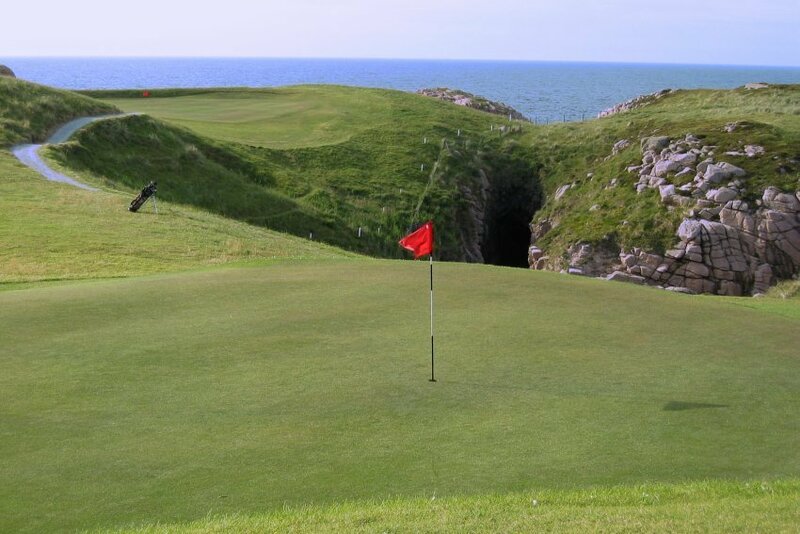 Though only nine holes, this remote course is superbly maintained, quirky, challenging and picturesque. The very definition of a hidden gem. Cruit island is a par 68 course with scenery the like of which is unmatched any where, the course is a little on the short side but great efforts have been made recently in the way of moving back tee’s and adding extra bunkers which have added significantly to the challenge. The greens have also been improved vastly since i began playing the course some 12 years ago. If your looking for a challenging game of golf for an excellent price with views to match then look no further than Cruit Island. Best 9 hole course ever played. Greens and tee boxes like you’ve never seen anywhere – magificant. Beautiful clubhouse with great food and friendly staff. No better way to spend a holiday than a trip to Cruit Island, keep your Peeble Beach and all the other big names, you haven’t played golf till you’ve been to the Island. Well Done!! This truely is Ireland’s hidden gem. I’ve played golf on most of Ireland’s famous courses, from the magnificent Ballyliffin to the overrated Lahinch and if the great professional in the sky said I could have one last round before finally putting out, I would play Cruit Island. the most enjoyment i’ve had playing golf. go. Well Cruit Island is the best course i have ever played in. The people are friendly and the golfers there are sensational. The course is a fine 9-hole course with easily reached holes and difficultly reaching holes. The Criut team won the Donegal cup in 1999 and they reached the final in 2001, this shows the talent that comes from Cruit Island. The course is stunning from the journey to get there to walking up to the first tee. we enjoyed playing there so much that my partner proposed on the last hole last oct.what did i say YES! Cruit is a joy to behold. A really friendly club set in magical scenery. It has a good layout which means the ever-present wind requires different a different approach on each hole. Watch your ball sail across the gulley to land on the 6th green and you’re hooked for life! It’s a course I’ll always go back to, well worth the journey. I’ve played Cruit in the summer and also on Christmas Eve, in all seasons it is the most senic place I have ever played and the staff are exceptional. You don’t care what your score is because you are too busy watching the beautiful sourroundings. I will be visiting my wife’s home in Dungloe again this spring and cannot wait to play there again. Stunningly beautiful course, very friendly staff and almost impossible to find. Just one big problem – it is the most unfair golf course I have ever played. Blind shots are the rule rather than the exception. Didn’t care though, because it was such a glorious place to visit.